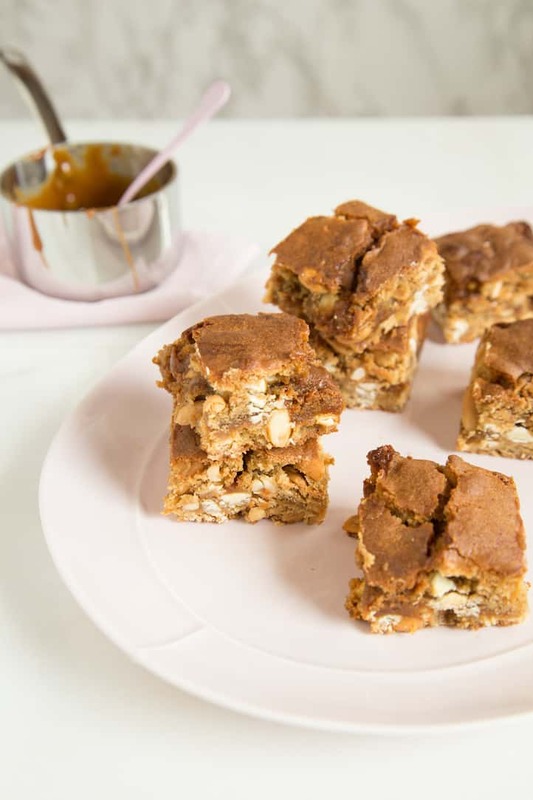 Peanut Caramel Blondies Recipe | Good. Food. Stories. 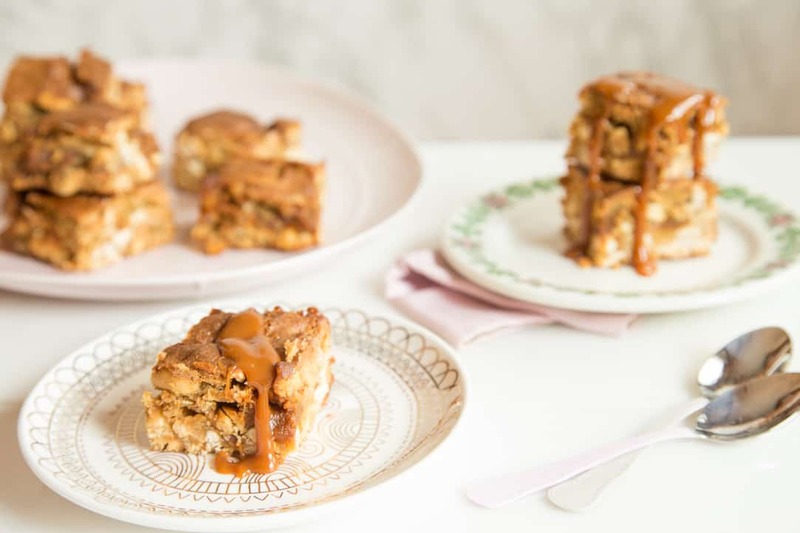 You can read this story of peanut caramel blondies two ways. One: as the latest iteration of my selfish goal to combine peanut butter, caramel, and chocolate in as many recipes as possible. Or two: as the latest iteration of my generous desire to make the most outrageously tasty treats to make my husband deliriously happy. You decide. Last summer, one of my clients asked me for a healthy-ish blondie recipe. I did my best to comply, replacing white flours with whole grains and nut flours, reducing the butter, and subbing in heart-healthy hazelnuts for butterscotch chips. b) my tree nut-allergic, serious-sweet-tooth husband couldn’t touch. Sometimes it’s no sweat off Dan’s back to have me develop and test recipe assignments that he won’t eat (see also: his aversion to mushrooms, seafood, and runny eggs, all of which I’ll happily take care of in his stead). But when it’s a food that he is head-over-heels about, like soft and chewy bar cookies, I start to feel crazy guilt about depriving him. 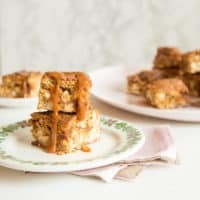 The whole time I was developing and testing the blondies, I kept thinking about how I’d switch it up to make it the mostest, bestest, Dan-est recipe if I had the chance. 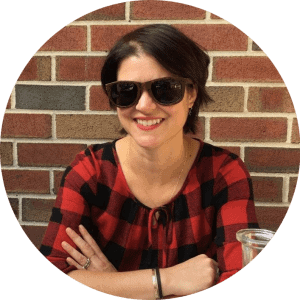 And then life and other assignments and trips to Los Angeles with red velvet brownies and trips to Boston with chocolate stout cake got in the way. Though the somewhat healthier blondie batter base remains, it’s been gussied up with copious amounts of peanuts and white chocolate chips. (I know, white chocolate is so divisive, but I love how it plays against the salty elements here.) And. AND. The crowning glory is inside: a thick, gooey layer of homemade peanut butter caramel sandwiched right there in the middle. He didn’t ask for them at all, but I have most definitely met the expectations of the client (husband) with these peanut caramel blondies. 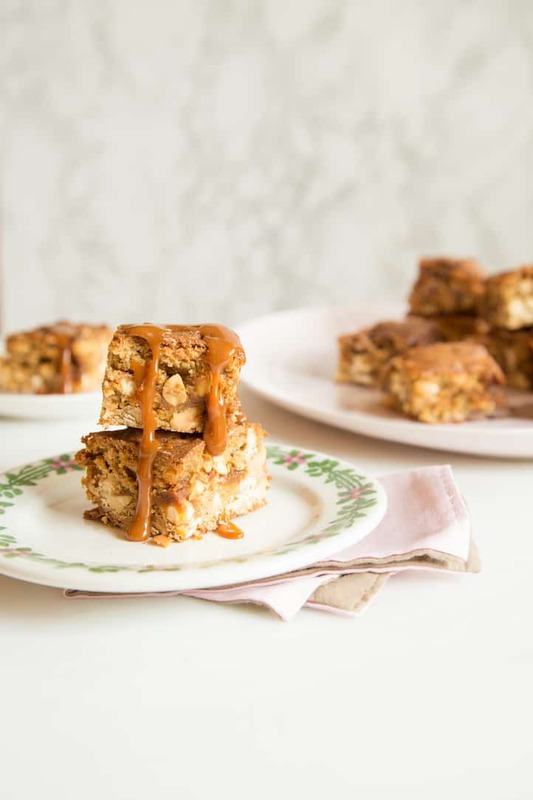 Peanut caramel blondies are studded with whole salted peanuts and white chocolate chips, with a decadent layer of homemade peanut butter caramel sandwiched in the middle of each square. Before you touch a burner knob, mise en place all your ingredients for both the caramel and the blondies. Line an 8- or 9-inch square metal baking pan with parchment paper. Whisk the all-purpose and whole wheat flours, baking powder, and salt together in a bowl and set aside. With a stand mixer fitted with the paddle attachment, beat the butter and sugar together on medium speed for 3-4 minutes, until the sugar is light and fluffy. On low speed, stir in the eggs one at a time until blended. Stir in the applesauce and vanilla, then scrape down the bowl one more time. Stir in the flour mixture a few spoonfuls at a time until incorporated. Stir in the white chocolate chips and peanuts. With a spatula, scrape 2/3 of the batter into the prepared pan. It will be thick, so start by dolloping spoonfuls into each corner of the pan, then into the center, and spreading to make a somewhat even layer. Pour the caramel over the blondies. Optional: you can reserve 1/4 cup caramel to reheat and drizzle over the finished blondies, or you can use the whole shebang right here. Dollop the remaining 1/3 batter over the caramel, using the same technique as described above. It's ok if the batter doesn't completely cover the caramel; it'll spread out as the blondies bake. Bake for about 30-40 minutes, until a knife inserted into the center the blondies comes out with moist crumbs attached. Do not overbake, or the blondies will not be soft and chewy. Cool the blondies in the pan on a wire rack to room temperature. Remove the blondies from the pan and cut into 16 squares. If you reserved any caramel, reheat in a small saucepan over low heat and drizzle over the brownies to serve. Store leftover blondies in a sealed container at room temperature for up to 5 days.